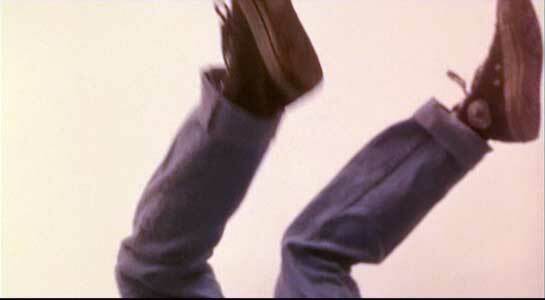 Thomas Ian Nicholas and Patrick LaBrecque wear black high top Converse “Chuck Taylor” All Stars in the film. 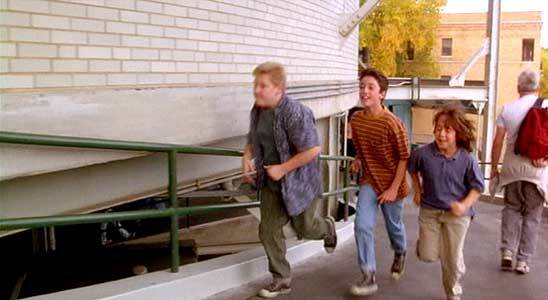 Henry and his friends enthusiastically climb the stairs to Wrigley Field. Little Leaguer Henry Rowengartner (Thomas Ian Nicholas) likes to play baseball. The only problem: he’s terribly clumsy and uncoordinated, so he ends up spending most of his time during games on the bench. And when he finally gets to go in a game, bad things happen, like when he loses track of where he is in the park and throws the ball away instead of to home plate. Despite his lack of skills, Henry remains enthusiastic about things, encouraged by his mom, Mary (Amy Morton) and his best friends Clark (Robert Gorman) and George (Patrick LaBrecque). One day at school, he wants to impress people, and runs after a well hit ball. Unfortunately, Henry trips over another ball and ends up breaking his arm, ending his baseball playing dreams for the moment. 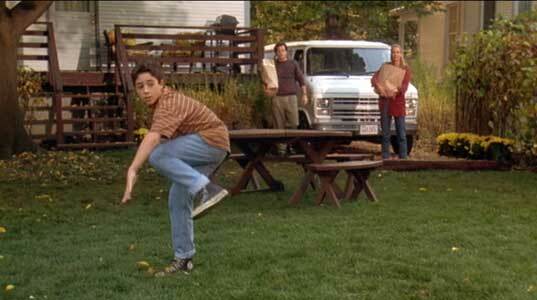 Several weeks later, when the cast comes off, Henry discovers that a tendon or something in his arm is very tight, and to his amazement, he now has the ability to throw the ball beyond the speed of a major league pitcher. 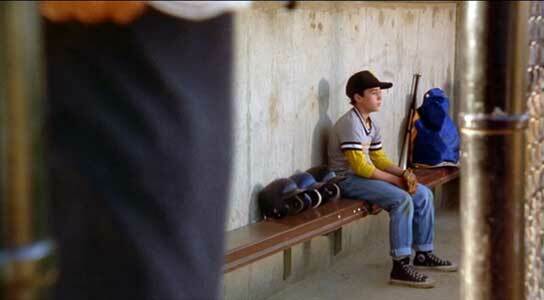 Henry spends a lot of time on the bench during his Little League games. School is now out, and as a reward, Mary has given Henry and his friends tickets to a Cubs game at Wrigley Field. The three go to the game and sit in the stands. A foul ball comes their way, and Henry is able to get it. At Wrigley Field, the tradition is when a ball is hit into the upper bleachers you are supposed to throw it back onto the field. When Henry throws the ball, it races like a rocket from the bleachers to home plate, and his secret is out. 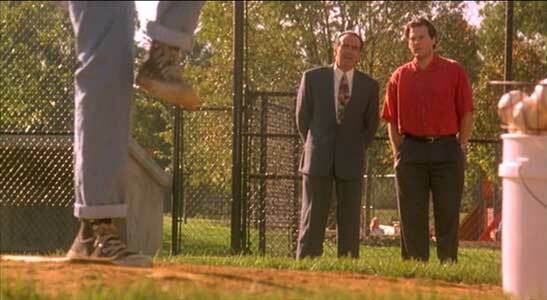 The Cubs owner (Dan Hedaya) can’t believe what he sees, and puts out a call to track Henry down and sign him to a contract, as the Cubs are in last place. 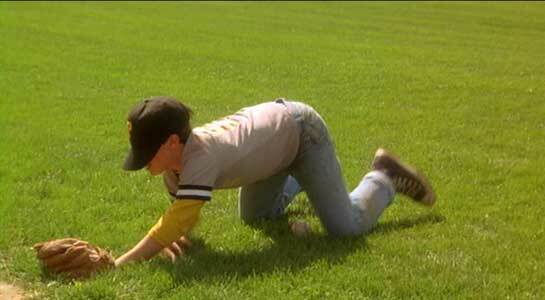 Henry fumbles around the field looking for the ball. Henry makes the unbelievable transition from 12 year old little leaguer to major league pitcher, and quickly becomes a success and a local hero as he helps the Cubs reclaim their team spirit and become contenders for the pennant. Henry also helps his team idol, veteran pitcher Chet “Rocket” Steadman (Gary Busey) regain his self-respect and ability to play, and Rocket reciprocates with valuable advice and tips. While this is great for Henry, it is tough on his friends who soon feel estranged and left out of the picture. John Candy also has a cameo role as the Cubs announcer (although this is played more for laughs than as a true Harry Carey). All of these things and the intervention of nature build to a climax as the Cubs vie for the championship in a single final game with Henry as the starting pitcher. Henry practices pitching with a laundry soap tablet. Rookie of the Year isn’t a great film, but it is a fun film, a little more realistic, and less manipulative than some of the other films in this genre, like Angels in the Outfield. Thomas Ian Nicholas plays the title role with a lot of enthusiasm and energy, and the film is well cast with good performances by Amy Morton as Henry’s mom and Dan Hedaya as the Cub’s owner. Director Daniel Stern keeps the pace fast moving, and doesn’t lose the perspective of the kids in the midst of all of the exciting happenings. Stern also makes an acting appearance as a bumbling equipment manager. This character and the stereotyped “I’m going to destroy you” heavy hitter for the opposing team really aren’t necessary for the film to work; it would be more believeable without them. You wonder why films like this always have these overplayed characters. The rest of the cast could certainly provide us with extra laughs by just giving them more interesting parts and lines to say. Overall, Rookie of the Year works because it mostly sticks to the subject of baseball, and is an interesting comparison of the Little League and Major League ways of doing things. It’s a pleasant diversion and fun family entertainment, especially if you have kids involved in sports. After tripping on the ball, Henry takes a great big fall. Henry shows off his incredible pitching spend to his amazed parents. 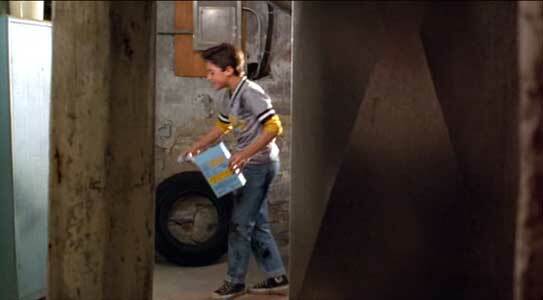 Both Thomas Ian Nicholas (Henry) and Patrick LaBrecque (Henry’s best friend, George) wear black high top chucks in the film. There are a few good shots in the film, but probably the best scene is when Henry is auditioning for the owner of the Cubs, and the camera shows several good closeups as he winds up for his pitches. After seeing Henry pitch, the owner of the Cubs wants to sign him to a professional contract. Rookie of the Year. (1993) Thomas Ian Nicholas, Gary Busey, Albert Hall, Amy Morton, John Candy, Patrick LaBrecque. Directed by Daniel Stern. Categories: Comedy, Family, Coming of Age, Sports.